Note! 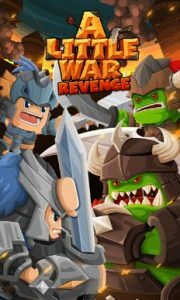 A Little War Revenge is a Free Game, but you pay for a better experience, if you don’t want to use this function, please turn off the iap purchase. You are the lord of Orc,back with your troops. There are four kinds of troops, they are swordsman, axeman,pikeman and archer(new), and other 6 mystery troops. There are restriction relationship between different troops which can check before the war. Soldiers can be level up, higher level soldiers have better abilities. Orcs’ HP, Attack, Defense, Move speed and Amount can be level up, higher level give better power. 6 skills are available in the war, need to use magic to cast them. Once the elf escaped from the jail, you need to catch and get the coins back. 10 Different dungeon with powerful BOSS, mystery troops can be get from them. Over 150 cards can help hero, soldiers and skills to level up. Orc Dark Goddess will give a assist to Orc hero in the war. Good game but it says guaranteed 3 star card with a 4 star dragon ball and that’s a lie and it says high chance of getting new soldier type when spending 450 diamonds but nope. Not to mention all the high success rate failures for the upgrades. It needs some work but fun for a couple weeks. I love the game however the game does not scale to my galaxy note 4’s screen and has been so since I first installed. Please fix and it will definitely be 5 stars.